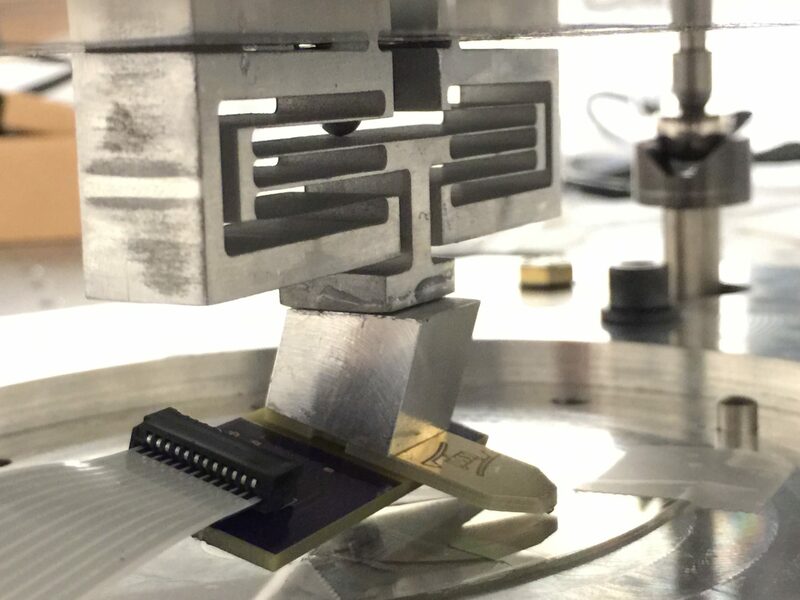 The goal of this project was to enable an atomic force microscope (AFM) to rapidly approach a sample using feedback from the amplitude of the signal from the oscillating cantilever. The AFM we used was provided by ICSPI and it unique in that the scanning stage, oscillating tip, and actuators are all located on a chip smaller than a finger nail. The AFM chip is attached to an X-Y flexure stage and mates with the wafer alignment mechanism I designed in order to allow rapid and repeatable sampling on silicon wafers. One of the larger challenges we have faced when working with this device is the limited 10 µm of travel on the MEMS stage in the Z-direction. Hand-placing the chip stage on top of the wafer alignment almost invariably leads to crashed AFM tips. In order to prevent this problem I designed and fabricated a coarse approach mechanism. My design objective was to design a mechanism that allows the AFM chip to have a travel range of 1 mm and coarse stepping resolution better than 100 nm. The total footprint of the stage was to be less than [37 mm x 20mm ] in order to fit on a stage designed for four AFM chips to scan a 100 mm wafer. We also aimed to achieve an approach time of less than 15 seconds.